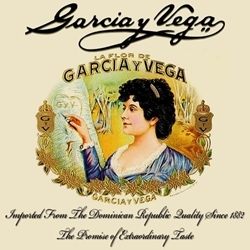 Garcia y Vega Cigars by are among the most popular machine made cigar brands in the United States and have been a favorite since their introduction in 2007. Each of these cigars are mild in taste, machine rolled with natural wrappers packaged in various box styles to ensure your cigars stay fresh and ready to use. Smooth and consistent are what make every Garcia y Vega cigar so popular with connoisseurs who love an excellent high quality smoke but at the fraction of the cost of a premium cigar. Smokers Discounts has made it affordable and easy to buy Garcia y Vega cigars online. Every product can be delivered right to your front doorstep. A variety of sizes and flavors are listed below in our online cigar store. Each of these styles are in stock and available for a low discount price! Call us for more details!